Charles Towne Square mall was built by Simon (then known as Melvin Simon & Associates) in 1976 in a suburb of Charleston. While not a very large mall, it housed three anchor tenants: Montgomery Ward, J.C. Penney and Edward's (a local department store similar to Woolworth) in addition to a multi-screen General Cinemas and approximately 50 other stores. It had the feeling of a "town square" with skylights, several large fountains and an antique replica of a "main street" type clock at center court. Although the mall didn't have a food court, it had several national eateries such as Chick Fil-A, Corn Dog on a Stick, Mrs. Fields and it's only original tenant still in existence today, the wildly popular Piccadilly Cafeteria. At the time it was built, Charles Towne Square was the only mall in the Charleston metro area other than the larger and older Northwoods Mall which was built in 1972 but had more stable anchors Belk, Sears, Thalhimers (now Dillard's), and the locally owned Kerrison's Department Store. Charles Towne Square continued to prosper throughout the seventies and early eighties but changes in local demographics including the closing of the nearby Charleston Naval Base helped contribute to its demise. Edward's department store was purchased by national retailer "Kuhn's" who rebranded it under it's "Big K" name (not to be confused with Kmart's Big K). The store operated for less than a year as "Big K-Edward's" before the Kuhn's company was gobbled up by Wal-Mart and the smaller "Big K" format was divested. The space did not sit vacant long and was purchased by Wilson's, a national catalog showroom retailer. Wilson's operated a catalog showroom here for a few years until they were bought out by Service Merchandise and the name was changed again. J.C. Penney and Montgomery Ward continued successful operations at the center. Penney's remodeled several times while Ward's never remodeled their large two-story location in the many years it was open. In the late 80's/early 90's, J.C. Penney decided it wanted to cash in on the success of the larger, more centrally located Northwoods Mall when the Kerrison's store there vacated it's spot and made plans to built a new store there. Similarly, Service Merchandise decided to consolidate two of its area locations into one newly constructed building in a more populous area of town near Northwoods Mall. As a result, the decision was made to close the smaller, aging location at Charles Towne Square. As Penney's and Service Merchandise left the mall, Montgomery Ward (with it's 1976 lime green shag carpeting) was left as the sole anchor tenant. Shortly before these anchor's left, the General Cinema also decided to close as it consolidated two of its smaller area theaters into new multiplexes. One by one the individual stores began closing their Charles Towne Square locations: D.P. Paul Jewelers, Radio Shack, County Seat, Fines, Waldenbooks and others were all gone almost overnight. Most mall tenants already had other stores in the area either at Northwoods Mall, or Citadel Mall which was built on the other side of Charleston in 1981 and was considered to be the area's newest and most modern mall with over 100 stores and 5 regional anchors. By the time the mall ceased operations, only a handful of locally owned stores were left along with Piccadilly Cafeteria and Montgomery Ward. Simon announced plans to demolish the entire center, with the exception of Montgomery Ward. Piccadilly made plans to build a freestanding restaurant in an outlot at the mall, and demolition began as soon as Piccadilly's new facility opened. Simon announced that the mall would be replaced with a "big-box" center adjoining Montgomery Ward possibly housing tenants including The Home Depot, Target & Chili's. Montgomery Ward stood alone on the vacant parcel for a number of years and was eventually joined by an 18-screen Regal Cinemas built on the former site of J.C. Penney. A Courtyard by Marriott hotel was constructed on an outparcel adjacent to Piccadilly, on the former site of the demolished J.C. Penney auto center (which later became a Firestone when Penney got out of the auto repair business). Montgomery Ward survived until the national chain went bankrupt in 2000. The cavernous two story building with the dated exterior and interior sat vacant until 2004 when it was torn down to it's shell and foundation and rebuilt as an office building. A locally owned art gallery which was formerly located inside the mall and had relocated to Northwoods Mall when Charles Towne Square was demolished came back to the center and occupied the former Ward's auto center outparcel building. 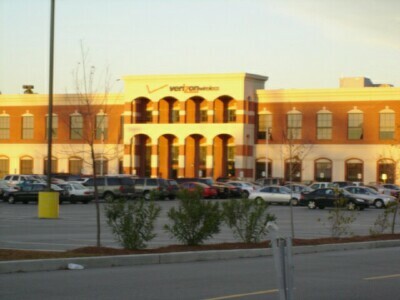 Verizon Wireless leased the entire office building that was constructed out of Ward's and opened a state of the art call center there in late 2004. 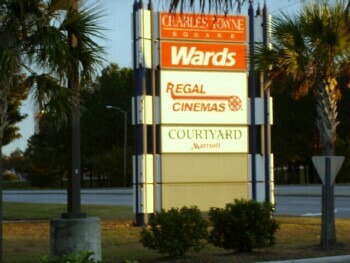 No other commercial development was started on the site and the mall's signage advertising "Charles Towne Square" and "Ward's" still stands at the entrance to the complex. Piccadilly, Regal Cinemas and the Courtyard Hotel still remain. It is doubtful that the planned "big-box" center will ever come to fruition, although Simon's leasing signs still remain.